Sprinter track crosses Inland Rail Trail on the bikeway to the Cal State San Marcos station. Construction has commenced at San Marcos on the missing link of the Inland Rail Trail bikeway to Oceanside. SANDAG officials said the 7-mile stretch would link he intersection of West Mission Road and Pacific Street in San Marcos to the intersection of North Melrose Drive and West Bobier Drive in Oceanside. The entire bike trail astride the Sprinter tracks will run 21 miles when completed. The missing link will connect with the eastern-most portion of the bikeway that runs from the Escondido Sprinter Station to the intersection of West Mission Road and Pacific Street. The western-most portion of the Inland Rail Trail, which will extend from Melrose Drive to Wisconsin Avenue in Oceanside, will be part of a future phase. Construction of the next portion of the Inland Rail Trail is likely to be accomplished in phases beginning this winter and going through 2018. The estimated cost is about $34 million. Funding will come from a variety of sources including Bicycle Transportation Account grants, TransNet proceeds and State Transportation Improvement funds. Popular with joggers, cyclists and skateboarders, the 8-foot-wide trail complements city efforts to support transit-oriented communities where residents can live, work and play. 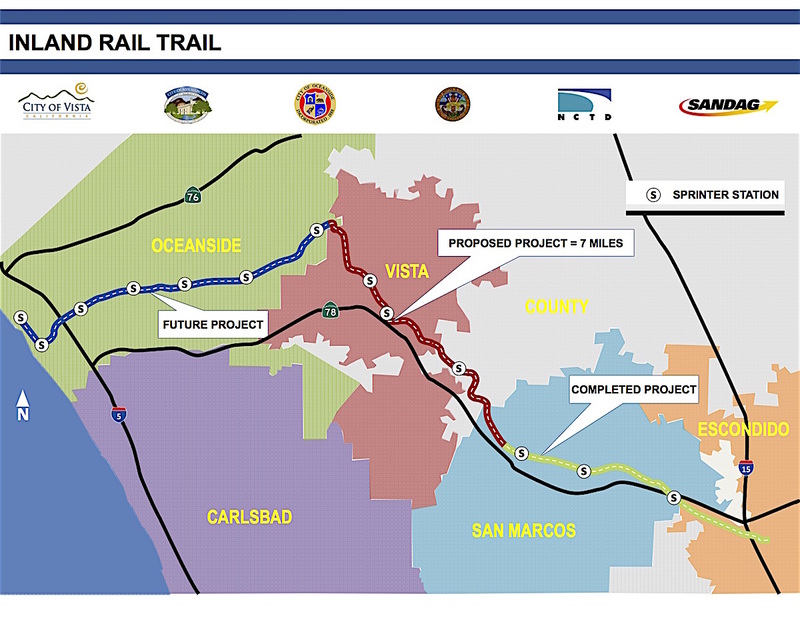 The Inland Rail Trail is a proposed 21-mile Class I bikeway located through the cities of Oceanside, Vista, San Marcos, and Escondido, as well as within a portion of the unincorporated County of San Diego. A class I bikeway is a bike path that is physically separate from motor vehicle traffic. In 2009, the eastern most portion of the bikeway was constructed in the cities of Escondido and San Marcos; that portion of the Inland Rail Trail begins at the Escondido SPRINTER Rail Station and ends at the intersection of West Mission Road and North Pacific Street in San Marcos. When completed, the path will provide access to five SPRINTER stations. The project is generally located in the North County Transit District right-of-way. The Inland Rail Trail is an important element of the SANDAG Regional Bike Plan and is considered a priority project. Completion of this trail and other similar Class I bikeways will help create an interconnected regional bike network throughout the region. For more information, visit the SANDAG Inland Rail Trail website or contact Project Manager Emilio Rodriguez, (619) 699-1979 or emilio.rodriguez@sandag.org. Be the first to comment on "Inland Rail Trail bikeway takes shape"